1. The Term ‘accounting period’ is used to refer to the __. 2. Assigning revenues to the accounting period in which goods were sold or services rendered and expenses incurred is known as ___. 3. An effective accounting system should provide information __. 4. Which of the following accounting records are source documents? 5. The instruments that are generated when firms enter into business transactions with others are called __. 6. The document that is used to acknowledge the acceptance of the return of goods by the seller from the buyer is known as __. 8. An advantage of the use of the voucher system is that it __. Use the information below to answer questions 9 and 10. Aminu and Sons credit purchases [Extract] as at February 1996. 9. The total for the purchases ledger control account is __. 10. 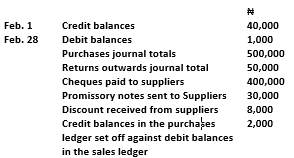 What is the balance c/d in the purchases’ ledger control account? Use the information below to answer question 11 and 12. 12.What is the gross profit margin? 13. The main objective of accounting report is to provide information about __. 14. 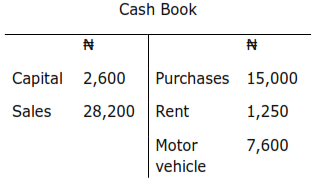 If liabilities amounted to ₦12,045, other assets ₦360,800 and equity ₦26,896, the cash at hand would be __. 15. In preparing the final accounts, the Bad debt account is closed by a transfer to the __. D. provision for bad debts account. Determine the cost of goods sold. 17. 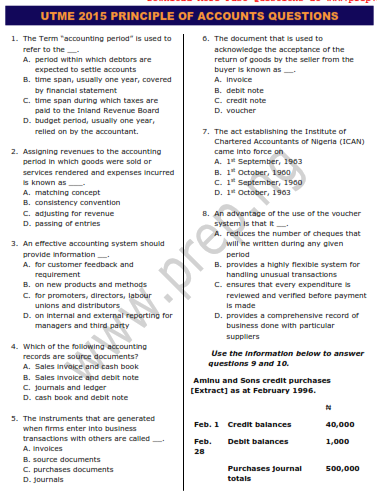 Which of the following is used to update the cash book bank reconciliation? 18. 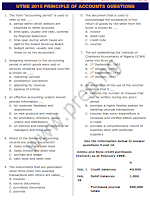 The two legally recognized professional accounting bodies in Nigeria are the __. D. Institute of Chartered Accountants of Nigeria and the Association of National Accountants of Nigeria. 19. A source document is used for verifying, the __. 20. The rule of accounting equation requires that account payable should be placed under __. 21. The double entry principle of accounting was developed by __. 22. The concept that has much influence over asset valuation and income determination is__. Use the information below to answer questions 23 and 24. 23. Calculate the yearly depreciation expenses using the straight-line method. 24. The rate of the yearly depreciation expense would be __. 25. In the trading. profit and loss account of a manufacturing organization, purchases is __. 26. Goods worth ₦50 000 were sent at different times from head office to the branch during the year. By the end of the period, only ₦40 000 worth of goods had arrived at the branch. Which of the following is correct about the treatment of this transaction? 29. Cash discount is often recorded on __. 30. The standing order is a payment instruction given by a __. 31. The major function of accounting bodies in Nigeria is to __. 32. Ledger account is mainly classified into __. 33. The historical development of accounting reveals that it__. B. is a product of its own environment. 34. In a trial balance. income and liabilities are __. 35. Ibrahim, a micro business operator, sold 10 bags of sugar to Jide at total cost of ₦12 000. The record in Jide’s book would be to debit __. 37. Accounting information seeks to provide__. 38. When the debit side total of an account exceeds the credit side total while balancing an account, it means that the account has __. 39. One of the differences between bookkeeping and accounting is that the former __. 40. The concept which states that revenue should recognized at the point when the sale is deemed to have been made is __.